5dp5dt ~ When you least expect it…. Yesterday was miserable I cried on the way to the grocery store, held it back in the store as we passed by families, infants and the baby food section but broke down into huge sobs as soon as we left. I told myself we would never have what they have. I knew this cycle failed. 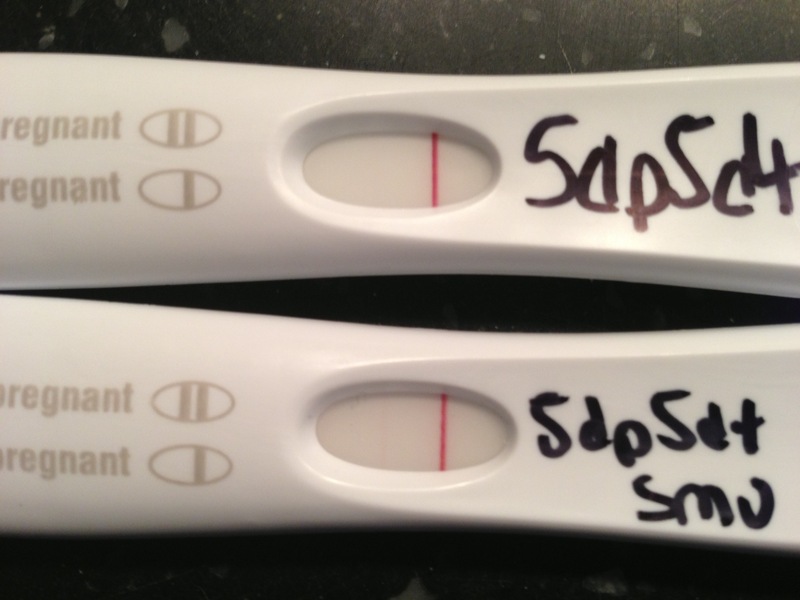 I made the hubby discuss what we would do next….adoption or another cycle. I started mentally figuring out finances and how we could not attend one of the weddings we were invited to. I was so sure it failed I had 2 glasses of wine. You can imagine my disbelief this morning. I just wanted to test knowing it was real early to get it out of my system. I figured if it was BFN then I would wait till Thursday to test again. The first test was FMU and I thought I was imagining I saw a line. There was no denying it when I took another test. It is light but it is there. 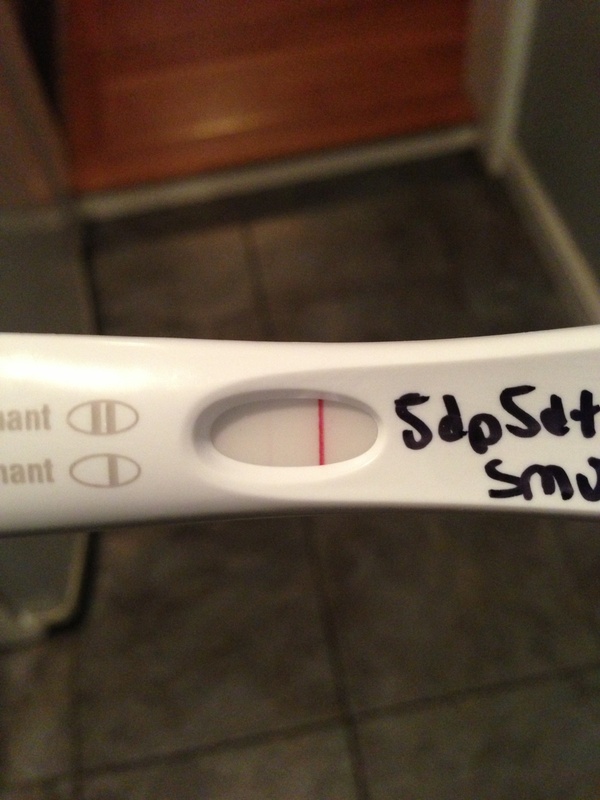 I can’t believe it…..I AM PREGNANT! Oh my goodness, I’m so happy for you! Congratulations!! Thank you! It’s early so I am cautiously optimistic and in shock! Congratulations 🙂 Wish you a calm and “no more drama” 9 months ahead. Yay yay yay! Congrats, Kim! oh my, so excited for you! For what it’s worth, I could see the line in the first one in the small photo in my reader! No question about it with the second and third photos! Definitely PREGNANT!!!!! Yes, it would explain my breakdown yesterday! Haha! Really hope this is it! Woooohoooooo!!!! Hoping and crossing fingers that the line just keeps getting darker over the next few days – but this is looking mighty promising!!!!!!! Congratulations!!!! Thanks I hope so too! It is dark pretty early so I am hoping for strong betas! Ah, congratulations. Hope that line keep getting darker in the coming days! Thanks I hope so too! CONGRATULATIONS!! So happy for you!! And tou gave me hope too 🙂 i tested and the trigger shot is almost so now I hope I can be as happy as you are!! I hope you get a BFP!!! I will be stalking you! Thanks! I hope so too. Still getting uber faint lines so either preggo or the triggershot is still in my system after 9 days. Congratulations Kim! I’m so happy for you! Walking around the house this morning with the same stupid grin I got when my own ivf worked 😀 When is your beta? Aww thanks Jess! 🙂 Beta is not till Saturday. It took longer than we wanted but I know it will be worth it! Thanks! I know yours will come! I hope very soon. Congrats! So excited for you! Wow, congrats! Has it sunk in yet???? Not at all! I am still so paranoid because I don’t feel pregnant!